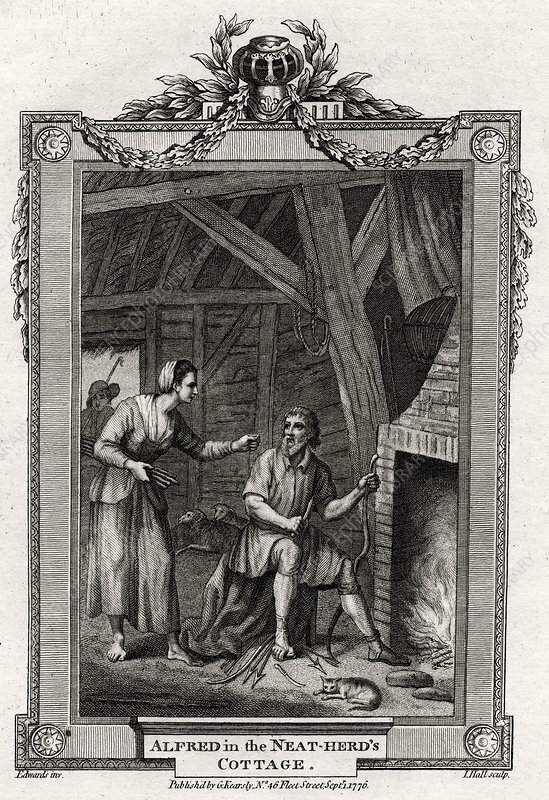 Alfred in the Neat-Herd's Cottage', 1776. King Alfred, in disguise, is rebuked by the Neat Herd's Wife, for letting the cakes burn. Alfred the Great (849-899), Anglo-Saxon king of Wessex from 871. Much of Alfred's reign was taken up with the struggle against the Danish invaders. After Alfred defeated the Danes at Edington, Wiltshire, in 878, England was divided in half, with the south-western part in the hands of the Saxons, and the north-eastern portion, the Danelaw, administered by the Danes. War broke out again in the 890s, but by 897 the Danes had been defeated. A plate from The Copper-Plate Magazine or A Monthly Treasure, London, 1776. Artist: I Hall.